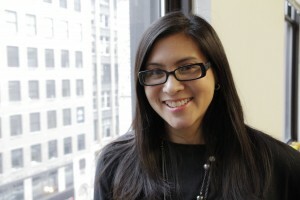 Dr. Denise C. Nacu is an Assistant Professor in DePaul University’s College of Computing and Digital Media. She has over fifteen years experience developing technology tools to support teaching and learning. Previously, Denise was the Director of Design at UChicago Impact (University of Chicago), where she led efforts to create interactive technology tools for educational improvement. Dr. Nacu has developed extensive experience that encompasses various stages of interactive technology development. She specializes in synthesizing ideas and creating visual representations to enable design and innovation in an educational context, particularly for innovations involving technology solutions. Her current research involves designing frameworks, tools, and data visualizations to enable teaching and learning in online social learning networks. Denise holds a B.S. in Art History with a minor in Psychology from Columbia University, an M.S. in Education (Educational Technology) from the University of Michigan, and a Ph.D. in Education (Learning Technologies) from the University of Michigan.